My oh my, WordPress didn’t like the spelling of “farkles.” That’s more of a motorcycle term, I suppose, but it basically means shiny stuff that might actually do something to help the vehicle. My rather limited research indicates that this is a portmanteau word, based on sparkle and function. When hubby gets a new ride, he often wants to invest in some farkles. Having bought (perhaps I should say perpetrated, based on its performance thus far) a new-to-us ride, I shopped online for some accessories. I began on eBay, but ended up purchasing via a site that insists I remove all links to its site. Anyway, I wanted genuine Toyota items, and our local dealership isn’t known for giving big discounts on much of anything. Via a relentless online vendor, I got some All Weather Floor Liners (deeper and more sturdy than floor mats) and a Genuine Toyota Cargo Tray , which is also deeper than a mat, if not quite as heavy. While not exactly “shiny” these items are handsome and quite functional. The car looks a bit better with these accessories. Now, if I could just buy a cushier ride…. My sometimes hated (but mostly beloved) minivan is no longer in my possession. After a few days of car shopping, I traded it in for a used Toyota. The van, a Honda Odyssey, was sixteen years old, so I suppose it was time. Still, it ran beautifully on the way to the dealership, so that drive was bittersweet. On the way, I passed by a yard sale, offering bikes and other things I might have purchased, because having things to do at Grandma’s house is where I am in life, but I didn’t stop, knowing that those items would probably not fit in the trunk of the sedan I was planning to purchase. Buying a car has changed since I bought my first vehicle, that’s for sure. Now, the first contact is often online. Whether one picks the “chat” function or sends an email, there will soon be a contact. The phone starts ringing. Go in for a test drive, and (in Athens, Georgia) there is a mandatory meeting with the “sales manager.” Then, a couple of times, I got an email to see if the salesman met my expectations. After I finally said I might be interested in a used Honda, I got an offer of $500 for my old van. As it has been more truck than family vehicle for a while, with the typical bumps and scrapes associated with that duty, I wasn’t expecting much. But, that deal had me paying more than the maximum KBB value on the seller’s car, with half the typical auction estimate on mine. Really, that wasn’t what I wanted to hear. Eventually, I ended up at a more rural dealership which didn’t use the “meet the manager” approach. I got $900 for my old van, which was still a very low number, and a newer car for less money. Oh, and I got to keep the new to me car overnight and take it for an inspection prior to purchase. The dealer even gassed it up for us before the extended test drive. After I’ve had this vehicle for a while, I guess I will know if it was a good purchase. But, I can say that the pressure to buy was less out in the country. In the mean time, I guess I’ll be looking for some accessories for the “new to me” ride. I’ve enjoyed this series by H. Paul Honsinger, a trilogy that begins with To Honor You Call Us , as a space opera for fans of David Weber or others in that vein. Lots of authors try this sub-genre (and my Trinity on Tylos dabbles in it for a few chapters), but most such efforts don’t hold my interest. Honsinger’s universe and characters are well thought out, and therefore more entertaining than other authors. His villains (the Krag) are truly obnoxious, and his hero, Captain Max Robichaux, has the right stuff to be a hero, but isn’t perfect, which is an unfortunate side-effect of being too heroic. Authors much achieve some balance, and Honsinger does that quite nicely. The captain’s side kick is Doctor Sahin, who is a bit like Dr. Watson’s being a sounding board for Sherlock Holmes. The situation is dire, for the enemy and the lengthy war have affected the human race in negative ways, such that surrender is unthinkable and victory an uncertain quest. For Honor We Stand is the middle book in the series, so I hope to read the final book soon, and I’ll try to post a more through review of the trilogy. Having just read an article in Popular Science online about what a”Generation Ship” might look like, I was gratified to see that some of the core concepts in my science fiction novel, Trinity on Tylos, are firmly rooted in science. The article speculates about what challenges the multi-generation inhabitants of a colonizing venture (based on an extrapolation of current space technology) might face. Topics addressed include propulsion, medical issues, livestock, and robot workers. In Trinity on Tylos, the alien captain of the Archeonite III has a big problem: his colony of survivors died out, but he has the ability to grow little Archeons from stored genetic material. He just needs some baby mamas, and my characters Venice Dylenski and Alathea Duke end up with the task. In the Popular Science article, We Could Move to Another Planet with a Spaceship Like This, the author mentions that “speculators say it’ll take 20,000 souls to start a healthy population on a new world. One space-­saving tip: Bring frozen embryos and people to diversify the gene pool upon arrival.” That’s right out of my novel, where Azareel and his android medical team design the embryos that Venice and Alathea gestate. As in the Popular Science article, robots are probably going to be the grunt workers of the future. In my novel, the Archeons use robots (as they take the form of their makers, I call them androids) as workers. A limited but technologically proficient population would no doubt employ robotic workers, freeing the populace to supervise or take on tasks that require a more creative mind. Trinity on Tylos is a complex story, because it goes beyond being just a space opera and delves into human relationships, made more complicated by the limited number of people with whom the characters interact. Also, it is a story of surviving on a somewhat hostile planet, solving such issues as having enough water to irrigate crops. The Popular Science article mentions farming as one of the most necessary activities once the generation ship reaches a new planetary home. Indeed, when I wrote Trinity on Tylos, I remembered the words of William Bradford, a leader of the pilgrims who settled Massachusetts, who wrote “what could they see but a hideous and desolate wilderness, fall [sic] of wild beasts and wild men—and what multitudes there might be of them they knew not.” Survival is not easy, and the Popular Science article, although very positive in outlook, does not ignore the difficulties that might face the future generations of humans whose journey began with some adventuresome ancestors. Technological progress and science fiction often go hand in hand, because what writers dream up, engineers can (sometimes) make happen. However, the reverse is also true— when creating a science fiction story, there must be some science blended in with the fiction. Trinity on Tylos is science based fiction, and it is available for your Kindle reader or Kindle enabled device; just click on the cover art. Sometimes, we forget what we could have had for free. I just talked to a business associate who lost her semester-long research writing due to a computer hard drive issue. Even the Geek Squad couldn’t retrieve her data. And, like many of us, she had access to cloud storage at school, included in her fees. Had she merely saved it a few times along the way, she wouldn’t have to start from scratch. Sad…. Recently, I read a short article in Market Watch about freebies that we might forget we have. Take a look while it is still available. Which one(s) have you forgotten? There are many themes in science fiction, and the one about an alien who is trapped on earth entering a host body isn’t exactly a new plot line. However, in this young adult novel, Karen McQuestion taps into the “kids dealing with big stuff” storyline that seems to be popular right now. (Think “Stranger Things” on Netflix or even Stephen King’s, IT! on the big screen.) Anyway, I didn’t find it difficult at all to get into this book and stay with it until the end. The main characters, Emma and her cancer stricken boyfriend Lucas, are believable, engaging, and their exploits are entertaining. Emma is particularly well drawn, and she is the point of view character for most of the novel. I’m not a big fan of young adult fiction, but I genuinely believe that the most creative stories these days are found in that genre. Publishers, large and small, are not prone to take any chances with fiction intended for adult audiences, but they are more open to new authors and new ideas in YA fiction. This has been true for quite a while, and this trend plays out on the big screen. The Harry Potter novels were quite successfully adapted to film, as were the Hunger Games novels. The Divergent Series is another YA science fiction series that made it to the big screen. Even Twilight and its sequels begat movies. Probably From a Distant Star won’t be the basis for a Hollywood block buster, but it would make a dandy film for the folks over at the SyFy channel. In the mean time, readers can find it in various formats, from $4.49 for the Kindle ebook to $10.95 in hard cover. Mostly, I intend to write about writing, but real life does get in the way of that, and this post is about the fabulous customer service I got from an online “dollar store” known as Hollar.com. When I ordered from them for the first time, I got several items to try, and a puzzle to share with my family, who are (just like mom) big fans of Star Wars. Let me be perfectly honest— the price for the 100 piece puzzle was $1. But, when the group effort was finished, one piece was missing. Hubby laughed at me and had some disparaging remarks about my being cheap enough to order a $1 puzzle. He is right about me being cheap, however. Slightly annoyed, I whipped out my iPad, took a picture of the 99 piece puzzle, posted it as a comment on the Hollar Facebook page. Within a few minutes, I had a couple of responses from concerned folks at Hollar. They asked for the order number, and when I replied via FB messenger with it, they assured me that I would get a new puzzle. I was expecting (maybe) a credit on my next order, but they said the item was in stock and would soon be on its way. Kudos, right? A few days later, I got the box, which was bigger than expected and heavier, too. Curious, I opened the box and there was another boxed Star Wars puzzle. Below it, heavily cushioned, was a very nicely framed Star Wars puzzle, with a missing piece, along with a personal note explaining that they, too, didn’t like missing pieces. Hubby, who had brought the box from the post office couldn’t stop laughing, and I was so pleased with the item that I immediately hung it. Nowadays, people love to say that almost all companies have “customer no service” rather than treating people right. Obviously, Hollar.com has a different philosophy, as well as a great sense of humor. Needless to say, I will be visiting the site again, because such great customer service deserves a second chance. Go check out Hollar.com. Really! I guess the subtitle is Weight Watchers vs. My Fitness Pal, as those are the only two I have used enough to review in a meaningful manner. Quite a long time back, I went to Weight Watchers and lost a goodly amount of weight, but I didn’t reach any goal. My thought at the time was that I had learned so much that I would be able to maintain my loss, and for a time I was somewhat successful. Fast forward a decade plus, and I was shopping the big girl’s section, which wasn’t much fun. Also, I became seriously concerned about the health effects of carrying so much extra weight around. As I was losing, hubby lost quite a bit, too. He and his doctor were happy with the change, so hubby decided to go “all in” on weight loss, but he was not about to pay for it. So, he decided to try the “My Fitness Pal” app, as the basic version is free, and it works quite well. Since I do most of the cooking, he was always asking me for assistance in recording his food intake, which weight loss programs call “tracking,” so I ended up doing both WW and MFP for a few months. I’m currently still at my goal weight, which means as a lifetime member, I can use the WW app for free, but instead I am using MFP. Both apps are very good, but for losing weight and learning how to do that, I would certainly stick with the WW app. By weighting (pun intended) certain foods, the app not only tracks users, but steers them toward healthy eating habits and better portion control. One excellent feature of the WW app is the recipes, which help users come up with a healthy recipe for whatever ingredients are entered. So, if I see pork tenderloin on sale, I can open the app and summon several healthy recipes right on my phone or iPad. However, the nutrition reports offered by the MFP app does a much better job of showing excesses or deficiencies in what I’ve been eating. For instance, I’ve been using MFP to help me keep up with how much protein I am eating, as I am a serious carb lover, and I might eat too many carbs and too little protein without those handy reports. In our high tech world, it is quite easy to eat too much and move too little, so apps such as Weight Watchers and My Fitness Pal are very helpful. Science fiction has long been a successful genre for film, far more so than for books. Perhaps it is the visual nature of science fiction, especially action/adventures, but even more cerebral films (2001 A Space Odyssey and A.I. for example) have had box office success. Most science fiction films nowadays are big budget affairs, but that was not so in the 50s. Recently, hubby chose a British science fiction film, The Machine, from the streaming offerings at Netflix. And while it was clearly rather low budget, the film is certainly worth an evening of your time, having scored 78% on Rotten Tomatoes. Few of the low budget films of yesteryear had the winning assets of this movie. Set in a near future UK, which is involved in a cold war with China, a computer guy who is working for the Defence Ministry is attempting to restore the brain function of injured soldiers. During the opening act, our main character, Vince, hires a young woman, Ava, to help him with programming. They hit it off, professionally and personally, and the audience learns that Vince has a daughter , Mary, with Rett syndrome, and success at work might help his daughter as well. When Chinese agents murder Ava, Vince ends up using Ava as his model for a weapon/AI who is known as “the machine” and this robot is quite an amazing being. As the film moves along, Vince’s daughter dies, but he has used his knowledge to scan Mary’s brain. The scans are precious to him, and these become leverage that his boss uses against him, because the boss doesn’t want an amazing artificial intelligence, but a weapon. The machine is trained as a super soldier, after Vince performs a procedure that he claims takes away its sentience, but as Vince is now of little value to the boss, the machine is ordered to kill Vince. The machine leads a rebellion, with the wounded soldiers as her platoon, and Vince is saved. Although the film isn’t as action packed as a Hollywood blockbuster, there is suspense. And, the ethics of research as well as the use of weapons provide food for serious thought. While the secondary characters lack much development, the main characters, Vince and Ava/the machine, enjoy a development and the actors (Toby Stephens, Caity Lotz) portraying them are very good. Again, The Machine, is a very good science fiction film, which blends near future warfare with lots of ethical debate. 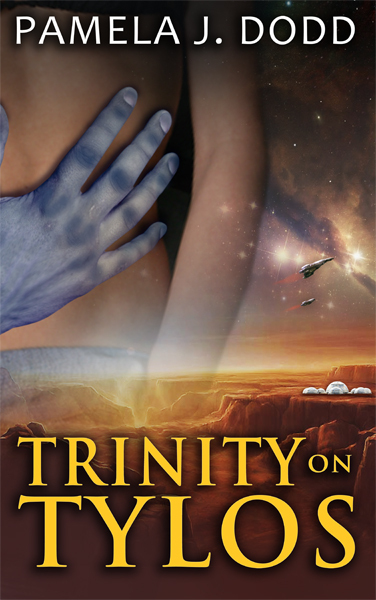 Recently, my science fiction novel, Trinity on Tylos, got a mention on the Goodkindles site. While preparing the copy, I did a web search for reviews, because I wasn’t too sure how many of those are still available. Surprisingly, I found a few, which were done based on the first edition, published by Whiskey Creek Press. Although they got the title wrong, I got a fairly good review from “The Romance Studio” site. Apparently that title is difficult, because the folks over at Books for a Buck misspelled it, too, but it is a decent review. And, the one by Harriet Klausner appears on several sites, including Bookreview.com. The best review I received was over at Fallen Angels Reviews, of course. While searching, I also noted that my efforts to publicize it have resulted in pirated copies online. Oh, here’s another one! And another one! I guess I should be flattered that someone thinks it is worth stealing. 🙂 Check it out!